This safari 15 days Uganda Safari takes you to the source of the Nile for white water rafting, Mt. Elgon national park, Murchison Falls National Park, Ssese islands, Kibale National park, Lake Mburo National park, Queen Elizabeth National park, Lake Bunyonyi, Bwindi impenetrable National park and a city tour in Kampala. On arrival at the Entebbe International Airport, you will be received by our delegate who will transfer you to your place of accommodation in the capital in Kampala. Head to Mbale found in eastern Uganda driving via Jinja, Uganda’s second largest town. The town is dominated by Asian quarters, brewery industries as well as colorful gardens. Explore the Source of the River Nile, the Gandhi monument, and later continue to the beautiful Bujagali Falls on river Nile a couple of kilometers from the source. Alternatively: try white water rafting, which in fact is the main attractions within Jinja. Have local dishes for lunch at Bujagali after which you will proceed to Mbale for your dinner and the night. Today you will have a nature walk to the beautiful Sipi waterfalls on river Sipi, on the slopes of Mount Elgon. The hike begins at Crow’s Nest camping and lodging area. You will walk past plantations of sugarcane, coffee and matooke along the way. Remember to take a along a packed lunched. In the afternoon you will Return to Jinja for dinner and the night. From Jinja you will drive to Masindi through Kampala, stopping at the Ziwa Rhino sanctuary to track these rhinos living here. Generally the drive is long yet very enjoyable taking you through the green countryside dotted with homesteads and farms. Dine and slumber at your lodge. Following breakfast you will continue to Murchison Falls National Park which Uganda’s largest protected area; named after the renowned falls on River Nile there. After lunch you will have a game drive through in the northern area of the park to see elephants, spotted hyenas, lions, bushbucks, cape buffalos, oribi, Rothschild’s giraffes, waterbucks and hartebeests, and if lucky see leopards. Dine and overnight at your lodge. After an early game drive you will return for breakfast at the lodge, and also have time to relax by the swimming pool. In the afternoon you will have a launch cruise on the Victoria Nile to the bottom of the falls only 10m from the “Devil’s Cauldron.” You will see numerous hippos, giant crocodiles and in a distance away see Uganda kobs, elephants and waterbucks. In addition you will be fascinated by the great profusion of birds here such as the uncommon shoebill stork, goliath herons, cormorants, Egyptian geese, Hombills, pelicans, kingfishers and bee-eaters. The boat will leave you close to falls and you will hike to the top of the falls for an hour and there you will enjoy breathtaking views seeing how the waters of the great Nile squeeze their way through a narrow 7 meter gorge and drop to over 43 meters below with a thunderous roar leaving a water spray that forms a beautiful rainbow. You will find your guide waiting there. Because it is a long drive from Murchison Falls NP to Fort portal, you will have breakfast very early and set off to the Southwest through the Western Rift Valley’s Albertine Escarpment. Drive through Bunyoro kingdom’s capital Hoima, the green countryside, traditional homesteads as well as tea plantations. Finally you will arrive in Fort Portal Tooro kingdom’s capital a very beautiful town in the shadow of the legendary “Mountains of the Moon” (Mt Rwenzori). Dine and overnight at your lodge. 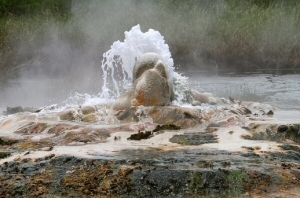 Today you will visit the breathtaking Semliki Valley National Park where you will have a game drive and visit the female as well as the male hot springs. After lunch, visit the Kasenda Crater Lakes that dominate this area offering beautiful views. Return to your lodge for dinner and the overnight. Drive to Queen Elizabeth National Park with a background view of the Rwenzori Mountain Range arriving in time for lunch. In the afternoon have a boat cruise on the Kazinga channel for 2 hours to see various animals like possibly the highest number of hippos plus about 550 resident bird species. This launch cruise provides great opportunities for photography, game viewing and birding. After the ride you will visit the beautiful Crater Lake Region and later return for dinner and the overnight at the lodge. Following a cup of coffee have a game drive in the morning along Kasenyi and Queens mile to see small animals, lions, kobs, elephants, waterbucks, cape buffalos, spotted hyenas plus warthogs and mongooses, in addition to various birds. Head back for lunch at the lodge. In the afternoon proceed to the Kyambura gorge to have a forest walk to trek habituated chimpanzees plus other primates. 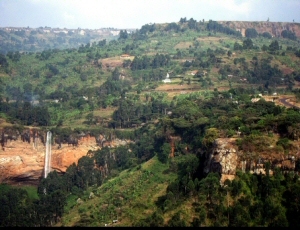 This Kyambura gorge is 16km long and 100m deep on the Rift Valley. You will be provided with a walking stick for the trekking. Dine and overnight at the lodge. Day 11 –climbing lions of ishasha. 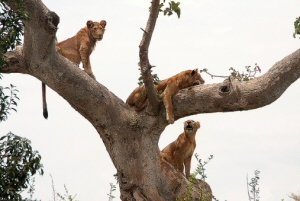 You will set out with a packed lunch to the Ishasha area of the Park looking for the tree climbing lions which can only be seen in this part of Uganda. Fortunately the terrain is open savannah scattered with acacia and fig trees. You will enjoy your picnic lunch and later continue to Bwindi Impenetrable National Park where you will dine and slumber. Right After breakfast in the early morning you will head to the park headquarters where you will be briefed before going gorilla tracking. Bring along drinking water, hiking boots, a walking stick plus a raincoat and a packed lunch. The joy of finally meeting the gorillas and even spending an hour with them and have a chance to take photographs and observe them play, feed and care for their young. Later leave for Kabala known as the “Switzerland of Africa” for diner and the overnight. Morning game drive in search of the beautiful impalas, zebras, cape buffalos, elands, oribi and topi. Along with the game drive, many visitors also enjoy a boat trip on Lake Mburo. The park is a very good opportunity for bird watchers, who will enjoy more than 250 species of birds found here. Return to Kampala for dinner and overnight. In the morning have a game drive to see elands, topi, impalas, oribi, zebras and cape buffalos; plus a boat ride on the lake. This park is a very stunning birding paradise with 250 bird species such as Carruther’s cisticolas, Papyrus gonoleks and Brown-faced lapwings. After lunch you will head back to Kampala with a stopover at the equator crossing for photography. Dine and slumber at your lodge. Today basing on your time of departure, you may have a city tour to the cultural sites, craft shops, museum or even the Mabira forest. You will later be transferred to the airport for your departure flight and this will mark the end of our 15 day adventure in Uganda – The Pearl of Africa.